Though affiliates at the top of the Detroit Tigers' system struggled in 2010, there are several positives to take from the teams at the lower levels. Triple-A Toledo and Double-A Erie finished last in their respective divisions, but West Michigan advanced to the Midwest League playoffs on the strength of a solid second half, and both Lakeland and Connecticut finished with winning records in competitive leagues. Catcher -- Max St. Pierre, Toledo Mud Hens (39 games)/Erie SeaWolves (20 games): St. Pierre's perseverance finally paid off this year when he was called up to the Major Leagues after 14 years and 978 games in the Minors. He slugged five homers in 20 games with Erie and then batted .300 with five homers and seven doubles for the Mud Hens. Following one of his better offensive seasons (10 homers was one shy of his career high), the former 1997 Draft pick was rewarded with six games for the Detroit Tigers as a September callup. SeaWolves manager Phil Nevin said, "Max is a guy who plays for his manager -- he's a managers' dream. Defensively. he's one of the best catchers you'll find in the Minor Leagues, and you won't a better arm even at the Major League level. He's a real leader. "He led our pitching staff and led our team, and he also got some big hits for us. His numbers don't jump out at you, but he had three game-winning home runs, and I know he was doing well in Toledo before he got hurt. "The feeling I had when I found out that Max was going to the big leagues is why I took this job. It couldn't happen to a better guy." First base -- Rawley Bishop, Erie SeaWolves (67 games)/Lakeland Flying Tigers (66 games): Bishop was as productive as they came in the Tigers' organization in 2010, leading all teammates at all Minor League levels with 87 RBIs. Bishop hit 18 doubles and six homers with 42 RBIs in the Florida State League where he was a midseason All-Star. His .301 average would have been fifth best in the league, had he had enough at-bats to qualify. 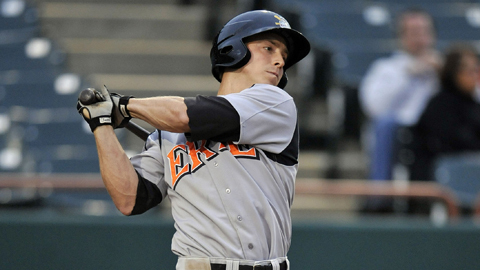 The 24-year-old then slugged nine homers in 67 games for Erie in his first shot in the Eastern League. "Rawley is someone who is just going to figure it out at every level," Nevin said. "I think he is going to play in the big leagues. He works harder than anybody and wants it as much as anybody. He's a very talented guy and defensively, he's a very good first baseman." Second base -- Will Rhymes, Toledo Mud Hens (95 games): The Texas native Rhymes combined discipline at the plate with speed on the basepaths. His .305 batting average over 95 games was sixth best in the International League, and he led the Mud Hens in triples (seven) and stolen bases (22). Rhymes walked more times (36) than he struck out (35), and he led the league with 13 sacrifice bunts before being called up to Detroit in the last week of July. Detroit Tigers' director of player development Mike Rojas said, "Will Rhymes is one of those blue-collar, blue-chip type of players. He's a hard-nosed player, he turns a great double play, and he did a nice job going up to the big leagues where he made a nice impression with his abilities." Third base -- Wade Gaynor, West Michigan Whitecaps (131 games): Gaynor's 91 runs scored ranked second in the Midwest League, and he appeared to make the adjustment from the Short-Season New York-Penn League pretty comfortably. He hit .286 and stole 13 bases, and he led his team with 10 homers and 80 RBIs. The 6-foot-3 Western Kentucky product also hit .367 over a 14-game hitting streak between July 5 and July 14, and he had a pair of three-hit, four-RBI games where he missed hitting for the cycle by only a double. "He struggled a little bit not this past year but the year before," Rojas said, "but this season we saw what the scouts did when they drafted him. He hit the balls in the gaps and hit for average, and he has a very good eye at the plate. "He doesn't strike out much, he plays a good third base, and he has an accurate arm." Shortstop -- Brent Dlugach, Toledo Mud Hens (117 games): Shortstop was not a position of strength across the Tigers organization in 2010, but Dlugach was arguably the best of the bunch. He hit .258 and scored 52 runs, more than any other Minor League shortstop in the Detroit system. He also homered six times, ripped 22 doubles and swiped a dozen bases -- one short of his career high -- in his second pass through the International League. Still, his season was not as strong as the previous year when he was named to both the mid- and postseason All-Star squads. Rojas added: "Brent's a very sure-handed defender who can play third and second as well. He did have some errors this year, but he also hit around .260 at Triple-A." "Gustavo Nunez with Lakeland was good, too. His average was down but he has great range, a great arm, great speed, and he's a switch hitter. We don't know where we're going to send him next year, but he's a definite Major League shortstop." Outfield -- Andy Dirks, Erie SeaWolves (98 games)/Toledo Mud Hens (22 games): In 2010, Dirks built upon last year's solid debut in the Eastern League and even earned a late callup to Toledo. The left-hander hit .296 over the two levels while setting career highs in almost every statistical category including runs (78), doubles (30), triples (three), homers (15), RBIs (63) and steals (22). Only two players in the Tigers organization stole more bases than the 24-year-old. After being named an Eastern League All-Star at midseason and getting promoted, the former eighth-round Draft pick batted .375 in the International League with 10 doubles and four homers in 22 games. Nevin, Dirks' manager in Erie, said, "The best way I can describe it is that, when you get to the Major League level, they find holes. Things get exploited. But Andy doesn't have any holes. "He hits left-handers well, and he hits the breaking ball well, and, when you're around him as long as I was, what jumps out is that he is a gamer. He loves the game and he plays hard. He just does everything good. "He throws well and runs well, and he's what we call 'baseball fast'. He's not going to light up a stopwatch, but he gets down the line as quick as anybody, and he goes first to third better than anybody. To me, he's a Major League player, and he's going to do well at that level." Outfield -- Jeff Frazier, Toledo Mud Hens (123 games): Frazier found his power stroke in 2010, leading the International League with 61 extra-base hits and ranking among the top four in both homers (25, fourth) and doubles (34, third). Nobody in the Tigers' Minor League system hit more longballs than the Rutgers product, and only Major League first baseman Miguel Cabrera went yard more often in the entire franchise this year. His total of 25 roundtrippers slaughtered his previous career high of 13 set in 2006. The 28-year-old Frazier, who scored 72 runs and drove in 73, was an All-Star in both halves of the season, and he was rewarded with a late-July callup to the Show, where hit .217 in nine games. "He did a great job hitting the ball out of the ballpark," Rojas said. "He had 20-plus home runs, and he was very hot towards the middle and end of the season. He did a tremendous job for us in Toledo -- he drove in some key runs and he was a leader on this team." Outfield -- Kody Kaiser, Lakeland Flying Tigers (63 games)/Erie SeaWolves (49 games): Kaiser ripped Florida State League pitching to the tune of a .325 average in 2010. The former 15th-rounder hit five homers and legged out six triples, and he also swiped 13 bases in 15 tries. The 25-year-old hit a blistering .488 (42-for-86) over a 21-game hitting streak between May 15 and June 6, and he was named to the FSL All-Star Team at midseason. He later received a promotion to Double-A Erie, where he hit .247 with four homers over the team's final 49 games. Over the two levels, Kaiser's .293 clip was fifth best among all players in the Tigers system. Nevin added, "He's a switch hitter and a contact guy who doesn't strike out a lot. He has some pop in his bat, but he hasn't stayed healthy, and he needs to play more baseball to understand the game a little better." Utility -- Casper Wells, Toledo Mud Hens (103 games): Wells embraced his first chance at Triple-A this season, slugging 21 homers and twice receiving a call-up to Detroit. In 103 games with Toledo, Wells recorded 49 extra-base hits and 46 RBIs. He made his Major League debut on May 15 after 31 games with the Mud Hens, but he was optioned back to Toledo after two starts and nine at-bats. Undeterred, Wells put together a fine season in Ohio and was recalled to the Tigers in August where he would remain for the rest of the year. Rojas said, "He did a tremendous job. He struggled a little bit with his average and his strikeouts, but he cut those down and made adjustments on his stance with the staff at Toledo, and he took off after that. "The kid works hard, and he deserves everything he gets. He's a great defender in the outfield. He can play all three positions, he's got a good arm, average speed, and he can hit the ball out of the ballpark." Right-handed Starting Pitcher -- Luke Putkonen, Lakeland Flying Tigers (27 games): Putkonen was the workhorse of the Flying Tigers' staff this season. The 6-foot-6 hurler tossed 152 2/3 innings -- third most in the Florida State League -- and he put together a 9-7 record with a 3.18 ERA, the second lowest mark among all Detroit starters in the organization. The former third-rounder struck out almost twice as many batters as he walked (87 to 44), and he won five straight starts in May and June when he allowed just six earned runs in 33 2/3 innings. "He's an inning machine," Rojas explained. "He goes out there every start and gives you strong outings. He has a good fastball, a good curveball and a good changeup. He just needs to be a little more aggressive, which he worked on during the instructional leagues. "He has a big frame body, and he's got a Major League arm." Rojas also said Jacob Turner was worthy of consideration. Turner went a combined 6-5 with a 3.28 ERA over two levels with the Whitecaps and Flying Tigers in 2010. "He has a great fastball and a great curveball," he added. "He's a very young kid who has developed into being a pitcher. We knew he had that ability, but now he is showing it in all aspects of his game. "He's learning the strike zone and the offspeed stuff -- when to throw it, how to throw it -- and he's done a tremendous job for us of learning how to pitch and how to command all of his pitches." Left-handed Starting Pitcher -- Adam Wilk, Lakeland Flying Tigers (24 games)/Erie SeaWolves (3 games): Wilk has come a long way since being drafted last year. After spending 2009 in the New York-Penn League and Midwest League, Wilk moved up two more class levels in '10. He won nine games in the Class-A Advanced Florida State League, where he walked fewer batters per nine innings (19 in 143 2/3, 1.19) than all but two starters in the Minors. He also went 2-0 in three starts at Double-A Erie. His combined 2.74 ERA led all starters in the Detroit system, and his 11 wins tied for second in the organization. Rojas said: "He's not an overpowering left-hander, but he knows how to pitch. He pitches in and out, uses all of his pitches -- fastball, curveball, change -- and he is a little deceptive to left-handers and right-handers as well." Relief Pitcher -- Brendan Wise, Toledo Mud Hens (28 games)/Erie SeaWolves (15 games): Detroit had a number of solid men coming out of the bullpen at all levels, including Wilson Palacios, Lester Oliveros and Casey Fien, but Wise was arguably the best of the bunch. The Australian converted all four of his save attempts in the Eastern League, going 2-0 with a 1.14 ERA in 15 relief outings and holding opposing hitters to a .157 average. Promoted to Triple-A in May, Wise threw 52 more innings over 28 appearances, predominantly in middle relief. For Toledo, he went 4-2 with a pair of saves and a 2.08 ERA. In total, Wise faced 308 batters across the two levels without surrendering a homer. "He has a power sinker, and he's one of those guys that can get by with one pitch," Nevin said of Wise. "He has so much sink on his ball. Do I think he'll pitch in the big leagues? Yeah, I would say he will. He can go out there and throw sinker after sinker and get ground-ball out after ground-ball out. He's someone who impressed me a heck of a lot this year." Ashley Marshall is a contributor to MLB.com. This story was not subject to the approval of the National Association of Professional Baseball Leagues or its clubs.